Since I shoot a lot of pictures with my iPhone, tune those photos and need to move them via WiFi, my iPhone 4S battery really takes a beating. By mid day, depending on how hard the phone has to work to get a strong signal for file transfers, the battery can be down around 40%. I have played with a lot of options to get the iPhone’s battery charged back up, without having to be tied to a wall socket. 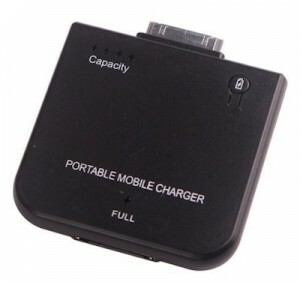 A variety of battery hardware, across a variety of both physical and power sizing. A couple items I have found; the battery doesn’t actually have to be large in physical size to recharge the iPhone. 1900 mAh is good to charge the iPhone twice from 50% power remaining. And, having the battery lock onto the bottom (I am not talking wrap around case styles here) of the iPhone isn’t always a great idea. I have found it isn’t a good idea to use the iPhone with a weighty battery hanging off the bottom… either have a jumper cable or stop a half hour to an hour to get the charge in place. A recent discovery is the Stitchway Ultrapower. When I first saw them, they were priced in the area of $40, which seemed reasonable. But, they are available on Amazon for less than $10 right now. Actually, if you go down the page a bit there is a Stitchway Ultrapower, an extra charge cable and charger cube for very little more. It make the whole set up rather mobile. The Stitchway Ultrapower does allow for pass through charging.